I’ve only gotten half-way through reading this article, but I couldn’t wait any longer to post a link to Jason Lisle’s response to Critics #3. For years now, the invasion of Christendom has been spearheaded by attacking the Bible. So much so, that now, even committed believers like Hugh Ross cannot see their own indoctrination to materialistic philosophies. In Dr. Lisle’s article, he engages with a critic, who accommodates secular teachings into his interpretation of scripture. Dr. Lisle uses hermenuetics, logic, and science to re-calibrate the critic’s flawed thinking. If you’ve ever wanted to read dialogue on how to engage a Rossian with solid scripture and sound logic, then you will enjoy reading. …at least do it properly. Do a little research, and then shoot your best shot. Christianity has survived 2000 years of constant attack and persecution. At least a dozen “science” reporting outlets falsely reported that the Bible got history wrong. If they had just done a few minutes of research by actually reading what the Bible said, they would see that forensic science is only JUST NOW catching up with divine revelation. Sadly, God’s people were duped (Joshua 9) and flat out disobeyed in several other circumstances (Judges 1) to allow the Canaanites to live among them. The findings of this forensic research doesn’t conflict with the Bible…it confirms scripture! Finding Canaanite DNA in living people is exactly what one would expect to find, because that is how the Bible reported it. We can trust God’s divine revelation about history, and we can trust him with the forgiveness of sins. Jesus fulfilled the scriptures by taking on the punishment of sin and defeating death. It is his great love that leads us to repentance. My little younger brother pointed me to your show a couple of years ago, and I’ve been listening ever since. I really appreciate the friendly format of the show. Every guest is treated with sincerity and the “debates” are free from personal attacks. Thanks for putting on a great show. So, I just listened to your latest Unbelievable podcast with Phil Copan. He handled a tough position of answering critical questions with dexterity. It did seem however that the atheist caller, Andrew, got the best of Phil when Phil was unable to answer the major flaw of old earthism. We could all hear the relief in Andrew’s voice when he knew he would not have to contend with a Christian who consistently and faithfully interpreted the Bible. When Andrew pointed out that since Phil believes in billions of years that there would have to have been terrible suffering and destruction prior to the sin of mankind, Phil could only deflect the question. His defense was to say that the atheist was in no position to judge evil, and this is true: atheism cannot account for evil in their worldview. But as a Christian, he did not present a positive and compelling case for believing that the suffering and bloodshed was a beautiful part of God’s “Very good” creation. His only defense was a very poetic passage in Psalm 104, that he mistakenly believes was part of the pre-fall world. A proper exegesis would show that this passage poetically deals with both creation, flood, and post-flood times. As I have listened to your show, almost every Christian guest that you have capitulates to the atheist’s origins story of billions of years. But there is no reason to give up Biblical authority to accommodate the atheist’s origins story. Biblical authority is at stake here. Genesis 1:1 “In the beginning, God created the heavens and the earth.” The earth was not formed billions of years after the beginning. Genesis 1:29-30 “everything that has the breath of life in it-I give every green plant for food.” Animals were created as vegetarian. No predatory behavior until after the fall. Genesis 1:31 “God saw all that he had made, and it was very good.” Because of God, we recognize goodness, and death/suffering/bloodshed is not part of this goodness. God chose to represent the death of his Beloved for thousands of years by having his people sacrifice an animal. But if animals had been callously dying for billions of years, why would the Almighty symbolize the cruel death of his son with something as common as animal death? Genesis 3:18 “It (the ground) will produce thorns and thistles for you” If thorns are a result of the fall of mankind, why are there fossilized thorns that evolutionists claim are millions of years old? Genesis 3:20 “Adam named his wife Eve because she would become the mother of all the living.” Phil and other old earthers disregard this passage by claiming that Adam and Eve could have been a representative couple within a large clan of hominids. All of humanity has to be a descendant of Adam and Eve for these Biblical passages like Gen 3:20 and Romans 5 to make sense theologically. Genesis 6-9 Global flood. There is so much here that gets missed when old earthers disregard scripture to preach a local flood. Exodus 20:9,11 “Six days you shall labor and do your work…For in 6 days the LORD made the heavens and the earth” It wasn’t billions of years or eras. Isaiah 66:25 “The wolf and the lamb will feed together, and the lion will eat straw like the ox…they will neither harm nor destroy” This passage is pretty clear that predatory behavior is harmful/destructive and is not part of God’s intention. Mark 10:6 “At the beginning of creation God made them male and female.” Jesus was teaching that mankind was created at the beginning of creation and not billions of years after the beginning…or must you question whether the Creator knows about modern cosmology? There are many more biblical reasons to reject old earthism and there are just as many scientific reasons to reject it as well. It would be nice to hear Christians defend God’s word without having to capitulate to the atheist’s primary tool for hammering at Christian foundations…the Word of God. And it is a shame that some Christians have rationalized the marginalization of scripture to accommodate modern political correctness in science, culture, and relationships. We can trust God’s revelation about the past; therefore He is trustworthy about the future! Praise the Creator!!! In today’s Christian culture, things labelled as Christian are allowed almost complete free-reign within the walls of Christendom. Christian music, Christian singles websites…attach Christ to it or stick a Christian fish on it, and Shah-bang! It’s acceptable to the millions of people, who identify themselves as Christians…with hardly a challenge. In an effort to engage the Christian culture through printed media, the periodical, Christianity Today writes articles about religion and other contemporary issues. In The Enemy Within, Part 1, an analogy was crafted using Homer’s epic poem, The Illiad. The Greeks brought down the mighty city of Troy without massive siege-works or modern explosives. Instead, they used Guile, Deception, and Temptation. Today’s modern Trojans, the protestant Christian church, has been fighting off attacks for centuries. A new tactic emerged in the 1800’s to replace God’s involvement in Creation through a “scientific” cause…evolution. And until recently, this tactic was wielded only at the hands of atheists. Although the mighty Trojan wall, God’s Word, has repelled the direct attack in a head-on fashion from the interior of protestant Christendom, the plot of evolution has recently been courted by those claiming to be have the interests of Christianity at heart. Christianity Today’s article, The Search For the Historical Adam, is a prime example of the Trojan Horse at the gates. As soon as the solid wall of God’s Word can be marginalized through the deception of evolution, the final destruction on the effectiveness of the church can begin from within. There are guardians on this wall. Those, who feel it is their duty to preserve God’s Word with valiant efforts. Answers In Genesis, Creation Ministry International, the Institute For Creation Research, and a hundred others are fighting the likes of Francis Collins and Reasons to Believe, who choose to rationalize the Bible by claiming it to be mythology. It is truly beyond the pale to hear these modern Greek warriors in their veil of scientific credentialism, their Trojan Horse, wield the enemy’s weapon, evolution, as if it were something that the church should embrace. And why did Christianity Today fail to interview even one of the guardians in their “unbiased” article? Only those within the Trojan Horse were interviewed for their contribution to the battle. Scanning the websites of the guardians, it is easy to see that there is plenty of scientific evidence and scriptural evidence to deflect the flaming arrows of the enemy. But we on the inside of the walls must not yield to the pressure of desiring cultural acceptance, and we must continue to trust God’s Word as true. Let’s not end this prolonged war the way the Trojans did by opening the gates willingly to the enemy. We must recognize the attack for what it is and stand firm on God’s Word. Do you remember the epic journey of Odysseus, Achilles, and Agamemnon in their quest to “rescue” Helen from the clutches of the Trojans? Since the Greeks won the war, they got to portray the Trojans as the villains, but what if a Trojan history book had survived. Could it be that Paris rescued Helen from an abusive marriage to Menelaus? What might have changed in the perspective of the story in how we remember this ten year war today? And do you remember how the Greeks were finally able to defeat the Trojans after failing for TEN years? The Trojan Horse. The Greeks constructed a massive hollow horse and hid a dozen warriors inside. They left the “gift” at the gate of Troy and pretended to sail away. Once the Trojans let the horse through the gates of their protective wall and celebrated the departure of the Greeks, their fate was sealed. The Greek warriors inside the horse opened the gates of Troy to allow the Greek army inside, and sleeping Troy was destroyed. The wall that protected Troy for a decade was impotent to stop the attack from within. 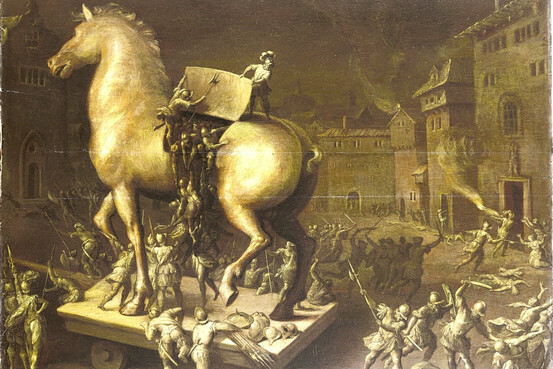 Once the Greeks deceptively eluded the walls with the gift horse, the destruction of Troy was imminent. Today, the idea of a Trojan horse is synonymous with inviting something that looks attractive into a vulnerable interior to its ultimate doom. The Word of God has stood as an impenetrable wall around Christendom since Guttenburg first printed the Bible on his printing press. Once people could read the Bible for themselves, heresies in the church were slowly discarded and evangelism has been able to grow. The bride of Christ has been under constant attack from many angles, but God’s Word has repelled the attacks. But in the last 150 years, a cleverly devised and insidious plot has surfaced to attack faith in God as Creator. As noted in the About link on this blog, “This blog exists to share the trustworthiness of God’s Word, the Bible.” Let’s start our evaluation of this timeline when compared to God’s Word. I’m going to start on the foot-notes of the timeline. “All dates are approximate and subject to change, and reflect the best established evidence.” What have we said time and again about evidence? Everyone interprets evidence according to their worldview. Evidence, by itself, cannot convince someone of their need for a savior. The BEST EVIDENCE is the eye-witness account of the Almighty in his special revelation not the priests of Darwin claiming the universe to be billions of years old. “Earth forms (4.5662 bya)” This timeline would have you believe that after more than 9,000,000,000 years, the earth formed. This is in direct conflict with the 1st verse of the Bible. Genesis 1:1 “In the beginning, God created the Heavens and the Earth.” Think of how different the very beginning of this timeline would look if they started with Genesis 1:1 rather than Stephen Hawking’s theories. “Moon forms (~4.5 bya)” The moon forms?????? How about Genesis 1:16 where God MADE the moon on day 4. And yet, you can clearly see on this timeline, that the authors put the creation of the moon on Day 1 in direct opposition to the Bible. Timeline trustworthiness meter: Waning. Far side of the moon. “Oceans become permanent (~3.8 bya)” They say Day 1, but the Bible says Day 3 in Genesis 1:9-10. Timeline trustworthiness meter: Lost at sea. Abandon ship! Somewhere in the Bermuda triangle. “Animals, reptiles, dinosaurs, mammals – Day 5” Wait a minute, Mr. Timeline! The Bible tells us that these animals were all created on day 6. Timeline trustworthiness meter: Dry bones. Extinct. Can you find more than that? The inaccuracies in this timeline can be fixed with a correct understanding of God’s revelation in scripture. Specifically, the group at reasons.org have butchered the exegesis of the worldwide flood. If one reads the eye-witness testimony of the worldwide flood and looks at the world around us, we see clearly that there is no need to mythologize the Bible to accommodate atheistic interpretations of evidence. Studying God’s word can fix these inaccuracies. We can trust what God has revealed about history, and our faith in his revelation about the future is secure. Praise Him! Last night there was a nationwide one-night-only release of the movie, Is Genesis History. My family went to watch, and the theater was packed. In fact, it appeared that they oversold the movie, because several people stood along the walls and sat on the floor. This tells me that there is a market for such movies. In fact, as I was researching their website this morning for this post, there will be a second one-night-only release of the movie on March 2nd. 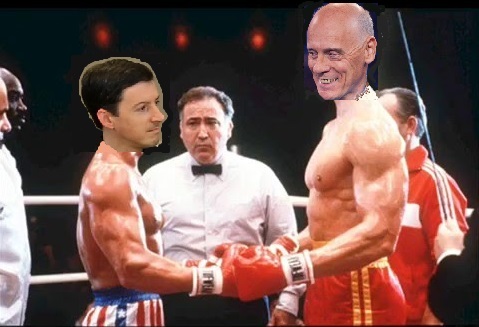 So, if you missed last night’s showing, grab a friend, and see if the question gets conclusively answered. “Is Genesis History” is a documentary in which Dr. Del Tackett travels the world trying to answer the question of whether the conventional paradigm (cosmic evolution, geological evolution, and The Grand Theory of Evolution) or the Genesis paradigm best accounts for the evidence that is seen in today’s world. He defined a paradigm as the framework in which evidence in interpreted. So in this question, do purely naturalistic forces best account for the evidence that is observed today or does the narrative of Genesis give us insight into earth’s history. I won’t give away all of the spoilers in the movie, as there were over a dozen scientists weighing in on the evidence, but I do want to hit a couple of the highlights. This blog addresses whether God’s Word is the authority, so let’s start with the imminent Biblical scholar, Steve Boyd PhD, and what he had to say about Genesis. When questioner, Dr. Tackett asked Dr. Boyd about whether Genesis claims and/or appears to be historical, Dr. Boyd replied unequivocally that the author of Genesis intended his audience to understand the text as having actually happened in history. The Hebrew people were God’s chosen people, and Genesis reveals the history of God’s interaction with their patriarchs in a smooth genealogical line. A paraphrase of one particular interaction with Tackett, Dr. Boyd says, someone would have to bring their own alien interpretation into the Genesis text to claim that the Bible can accommodate billions of years by redefining the Hebrew word for day. It is clear from the text, that the Hebrew word for day in this context is not plastic enough to mean billions of years as some groups would have us believe. So, from this interview, the question is answered with the affirmative: Genesis is history. Dr. Tackett also interviewed Dr. Paul Nelson. They met in a computer museum and talked about the history of information. One particular interaction caught my attention. They discussed how biological evolution claims to be plausible by building from a single celled organism to all of the diversity of life by compiling more and more cells over millions of years. In the same way, do we get complicated computer operating systems and programs by adding zeros and ones (which is the foundation of computer language) randomly over years and years? Both ideas are equally ridiculous according to their interview. This interview also affirmed that Genesis is history. The last point I wanted to make in this post wasn’t drawn out in great detail, but the idea of the Eye Witness was brought up. When discussing issues of history, an eye witness has value. As an analogy, consider a crime that is being investigated by a local police station and the FBI. Both offices employ a forensics team to help determine the culprit, however, the FBI has an eye witness that was at the scene of the crime. Now consider that this eye witness was a justice on the supreme court…someone who is very familiar with evidence, law, and judgement. Would the local police office, who employed ONLY a forensic team in their investigation be able to build as solid a case that accounted for all of the information as the FBI, who employed a forensic team and had an eye witness? The Genesis narrative is written as history from the perspective of the Supreme Judge, and his eye witness account is not lightly dismissed. I highly recommend the movie. There’s no action, no CGI, and no plot twist, but the information is fantastic, the experts well-spoken, and the conclusion is important. Since we can trust what God has revealed about history, we can trust Him with our future.